Since starting Spyderco knives, the company has been told their knives are different, peculiar--even out there. All true. Thinking beyond established knife industry barriers allowed Spyderco to introduce new and radical innovations to the knife culture including: one-hand opening, serrations on a folder, and a clip to attach a knife to a pocket. Spyderco didn't go into business to rake in a mountain of dough, they're here for more selfish reasons--indulging our passion for creating knives. Spyderco is definitely out of the norm in the knife industry in their dedication to researching and developing fresh, improved, and better performing materials--all with function and reliability being key. 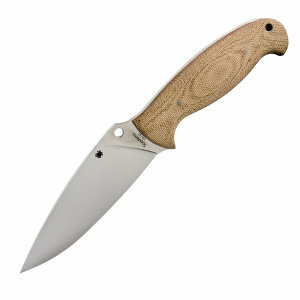 Moran Drop Point Skinner, Kraton Handle, Plain. Moran Featherweight, Kraton Handle, Plain. Assiste w/Carbide Tip Black FRN CombinationEdge. Military Model, Digital Camo G-10 Handle, Black Blade. Dragonfly Tattoo, Stainless w/Poly-Chromatic Handle. Embassy, Aluminum w/Black G-10 Handle, Black Blade.